It gets harder every year to get into some of the University of Washington’s most in-demand majors, creating a cutthroat system of competition at the flagship university. By the end of his freshman year at the University of Washington, Jack Kussick believed there was no point in even applying to get into the UW’s bioengineering program. Kussick had sailed through Seattle’s Roosevelt High with top grades. When he entered the UW, the Seattle native was thinking about a career designing cutting-edge rehabilitation tools that could help wounded veterans get back on their feet, or athletes devastated by injury return to their sports. But college required an entirely different type of studying. As a freshman, Kussick stumbled in a few classes before he figured out a system that worked for him. By then, he believed, it was already too late. In order to be competitive for bioengineering, a counselor told him, he’d need to begin making A’s in nearly every class. Even then, his chances of being admitted were slim. At a time when students are encouraged to go into careers in science and technology, as well as business, it’s becoming harder and harder to do so in some majors at the state’s largest flagship university. Of the roughly 2,000 students in each class who say they want to major in one of the engineering disciplines, fewer than half will get in. And for the business administration major at the Foster School of Business, the admission rate is 40 percent. Some faculty say that’s created a cutthroat system that forces students to compete against one another — at a time when they should be learning how to work together. In high-demand majors, the university is “having to select from a group of students who are amazing, and bright, and capable, and could do well,” said Patricia Kramer, an anthropology professor who heads a faculty committee trying to solve the problem. “This isn’t weeding out students who are not good,” she added. The pressure to build a perfect transcript also means students sacrifice many other experiences that make up the fabric of a good college experience, said Brian Fabien, the associate dean of academic affairs for the College of Engineering. There’s no easy solution. But the UW will be asking more questions about a student’s area of interest on its freshman and transfer admissions applications. At some point, that information might be used to decide who becomes a Husky, and who does not. On the third floor of Loew Hall one day last week, a half-dozen pre-engineering students waited in line for appointments with academic counselors to fine-tune their schedules, or ask for advice. Most were upbeat about their chances of being accepted into engineering’s disciplines — mechanical, civil and computer engineering, to name a few. But the reality is that fewer than half will be admitted, Fabien said. Students get several chances to apply, but in the meantime they are in limbo about their major, and some won’t know for certain until their third year, ”which is actually pretty cruel,” he said. Taylor Ishida, a sophomore who wants to major in bioengineering, stays in the library studying until 10 or 11 p.m. every night. “It’s definitely stressful, knowing the level of competition,” she said. Ishida, who grew up in Oregon, says her academic record is strong, but she’s an anxious test-taker, and often wakes up at night worrying about how she did on her last exam. If she doesn’t get into the program, she’ll transfer to another university. Allen Putich, a first-quarter transfer student who earned his associate degree from Skagit Valley College, knows it’s hard to get into his intended major, computer science; he spent an entire week studying for his first midterm. He thinks his chances are good, but he’s got a backup plan: electrical engineering. Khanh Le, a sophomore, has been turned down once already trying to get into either industrial or civil engineering, and says she’s under a lot of pressure now to get in. Le, who graduated from Mariner High School in Everett, said if she doesn’t get in on her second attempt, she may take a year off — or transfer elsewhere. No major is more competitive than computer science — only about a third of the students who apply get in. For those students, some help is on the way; the UW has gotten millions from private industry and the state Legislature to construct a new computer science building, which will allow it to double the number of students it can handle in the coming years. Students who can’t get into engineering often choose math, chemistry or physics — and that puts stress on those majors, too, Fabien said. Those who don’t get into the Foster School, for example, often choose economics as a backup. That major is no shoo-in, either — it only admits about two-thirds of applicants. Engineers are trained to be collaborative, so they can solve problems together. But the hypercompetitive environment at the UW means students are in a race to beat one another. It’s exactly the opposite of the skills they’ll need in the workplace, Fabien said. Why can’t the UW simply eliminate majors that are falling out of favor, and use the money to hire more engineering professors? Engineers need to learn on expensive and space-consuming equipment, Fabien said. For example, mechanical engineers at the UW work with machining equipment similar to what’s used in a Boeing facility. The engineering college also needs students who can write, and have an understanding of history, political science and the humanities — not just good grades in math and science. “You can’t be a good engineer if you can’t communicate,” he said. Kramer said the slowness with which the university builds up, or cuts back, on majors is an important check on chasing the latest fad. Ten years ago, for example, the university resisted pressure to reduce instruction in Eastern European languages. Now, because of unrest in Ukraine, an understanding of those languages and cultures is in demand, she said. Before the university starts considering a student’s “area of academic interest” in deciding who is admitted, all three campuses would have to approve that change. Kramer expects there will be changes in the way the university makes its choice on offering admission to out-of-state and international students. For in-state students, in contrast, she thinks the changes will be minor. “Our obligation to Washington state students is really different” from the university’s commitment to out-of-state and international students, she said. For transfer students, an applicant’s intended major already has a bearing on whether he or she is admitted. A transfer student who selects only one major on the application, and is not admitted into that major, also is not admitted into the university, she said. Meanwhile, the College of Engineering has proposed a system in which about 50 percent of engineering-major prospects would be directly admitted to the college at the same time they are admitted to the UW as freshmen or transfer students, although they would still need to apply for their specific major. No decision has been made, but Fabien noted that it’s a practice already in use at most other major engineering schools. And last year, the UW Student Senate passed a resolution calling for that change. The trouble with direct admission, Kramer said, is that it can deprive students of the chance to explore different subjects, or pursue careers they might never have heard of in high school. That can be especially hard on those who come from rural or low-income schools — students who may have never met an engineer, or explored a great science lab, she said. Computer science professor Ed Lazowska said there’s no right way to handle the overcrowded-majors issue. Elite private universities allow students to choose any major they want, Lazowska said, but getting admitted to those universities in the first place is like winning the lottery. On the other hand, some major public universities give students a relatively free choice of their major, but use “weed-out courses” — extremely difficult prerequisites — to reduce the number of students going into certain majors, he said. Meanwhile, just up the road in Everett, Washington State University’s new North Puget Sound campus is adding more slots in electrical, mechanical and software engineering. The mechanical engineering program, which can accommodate 40 new students each year, had twice that number of applicants this January. 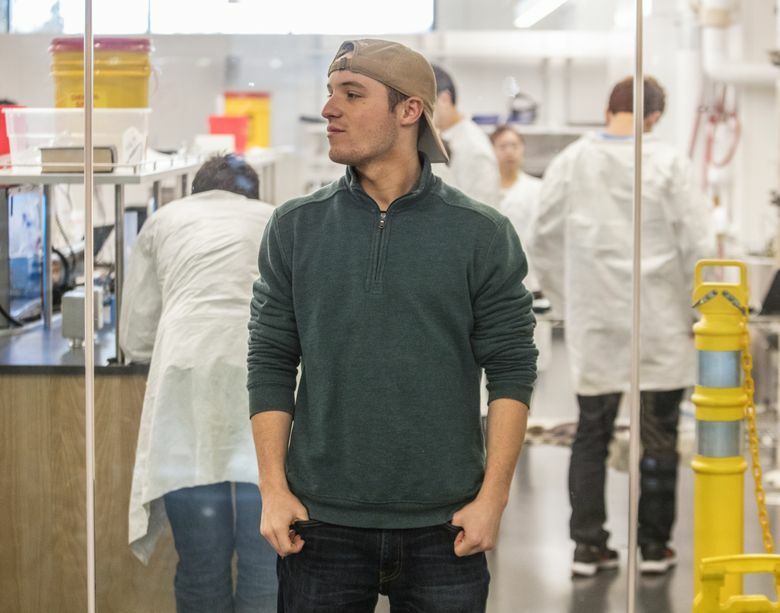 Kussick, the UW student who thought he would never get into bioengineering, solved his dilemma by transferring to Oregon State University at the start of his sophomore year. He is making A’s in all his classes — “I’m doing better than I’ve ever done at school” — and was admitted to the pre-bioengineering program. His interests have expanded into robotics, and he’s also thinking about medical school or earning a Ph.D.
Kussick is 250 miles from home, and because he’s an out-of-state-student, his family’s paying about $13,000 more a year in tuition and living expenses than they did while he was at the UW. But he’s happy with his decision to move to Corvallis. “I’m loving it down here,” he said.